11" x 14". 12 sheet per pad. 11" x 14" student-grade watercolor paper with uniform texture and whiteness. Ideal for wet and mixed media techniques. Acid free. Recyclable. 12 sheet per pad. I found that this was way too expensive for a group of young kids. 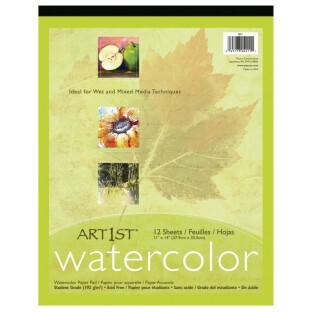 The watercolor paper 11x17 80-lb pack of 100 is more economical. They are basically the same thing. Merchant response: The item recommended in this review is PE861.